We like to raise our own meat chickens each year. We like knowing what our food eats, that it has had a happy life and has been treated humanely, both in life and in processing. You just never know all that with any store bought chickens. Our meat birds have had a happy life, living on the grass and being able to move about as much as possible. When it comes time to process them, we do it quickly and humanely so they don’t suffer. You can read more about that here. Storing the meat is another issue altogether. We usually try and freeze some whole, as well as freeze some that are broken down by parts, like breasts, legs, thighs, wings. However, our freezer only holds so much, so we wind up pressure canning chicken for storage. It does make it easier to store, there’s no worry about power outtages, and you can basically open a jar and use it as is. Pressure canning chicken isn’t hard, and once you get the hang of it, you may want to can ALL your chicken! Pressure canning whole chickens with bones makes it easy to store on your pantry shelf and essentially make your own grocery store. 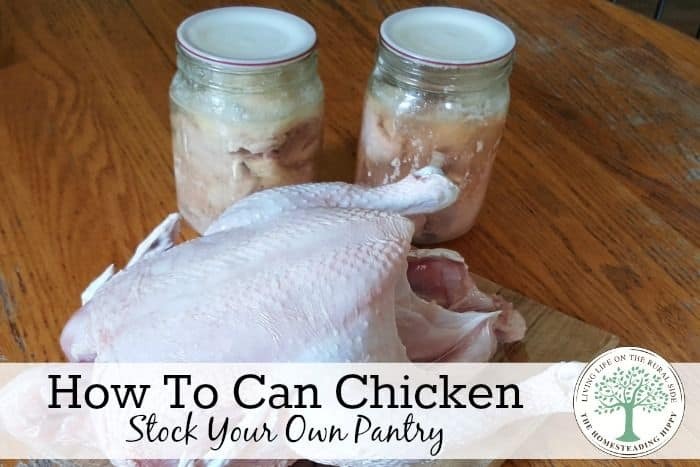 Of course, if you can’t raise your own chicken, you can still stock your pantry by canning chicken at home. Watch the sales at your store, and when the parts or whole chickens go on sale for a good price, this is a great way to stock up without overrunning your freezer! For directions on pressure canning beef, check out the post here. Start with a clean bird. By that, I mean fully rinsed, all feathers removed, and all the insides taken out. I always, always, always have to double check this as my kids are known for forgetting to remove the lungs…but I digress. Simply cut your bird into pieces, along the fat lines and joints. Remove all the skin, even from the dark meat. The skin tends to make it greasy and can lead to sealing failures. I leave the bones in the legs and thighs and remove all the bones from the breast meat. Make sure to save the carcass for making bone broth (get the directions here) and you can even can that to store for later use. Fill clean jars with the meat. I use the canning raw chicken, or raw pack method, from my canner’s instructions, but you can also cook the chicken to medium done first, if you prefer. For how to can cooked chicken, you will want to simmer the pieces in broth for 15-20 minutes until medium done. Proceed with the rest of the steps. For canning chicken leg quarters, I have found it’s best to cut them into separate thigh and leg pieces. for legs, I do 4 pointed down and 3 pointed up, every other one. For canning raw chicken thighs, I simply stack them on each other. Usually, I can get 6-7 thigh pieces in a widemouth quart jar. For breasts, I stack them on top of each other whole and Then, fill the jars with hot water or broth, leaving one inch headspace. Fill jars with broth or water to 1 inch headspace. Use a rubber spatula to remove air bubbles by running it alongside the inner edge of the jar. Wipe off the tops of jars to remove residue. Add new lid and clean band, screwed down finger tight. Pressure can at 10 pounds pressure for 90 minutes, adjusting for your altitude. Water bath canning chicken is not recommended, as it doesn’t get hot enough to kill off bacteria. Allow the canner to cool on it’s own accord, remove the jars and set in a cool, non drafty place for 24 hours. Check seals, wipe the jars and store in your pantry. Any that didn’t seal, of course, put in the fridge and use within 2 days. For easy directions for pressure canning chicken soup, read the post here. Are you familiar with canning chicken at home? What’s your favorite ways to use canned chicken in recipes? Thanks for this post! I love the convenience of canned chicken but it’s so much more healthy and frugal to do it yourself. I have canned some pickles and spiced peaches in water-bath before, but just got my pressure canner today. Thank you for a very simple step by step process for canning chicken. Any recommendations to spice the meat a bit, and is it ok to can it in commercial BBQ sauce? Thanks for providing a great resource ! Ok, I made canned chicken. Now I need ideas to use it other than soup. I’m already a soup queen!